From the moment I met Jesse I knew that when I got engaged he would be the DJ for my wedding. Jesse and Laura checked in with me the week of the wedding to make sure everything was in place and we were ready to go. I was married July 1, 2016 and Jesse kept the dancing and fun going until we were told it was time to leave!!! My husbands family is Serbian and Jesse did a wonderful job honoring the traditions and spoke about them flawlessly! Both mine and my husbands families are large and we all enjoy to dance so the floor was always full of smiles and laughter. Jesse played all the music we love just by feeding off of the energy on the dance floor (because I didn't give him much of a guide). We are also into country line dancing and Jesse made sure to play all of our favorites and encouraged others to get out on the dance floor and learn the dances. Throughout the whole night people were complimenting how GREAT Jesse was and most definitely the BEST DJ they have ever had. He also played the music for our ceremony and it was exactly what we wanted. Our wedding was perfect and we can't thank Jesse enough for helping us create those beautiful memories. Any bride would be lucky to have him for their wedding day!! Jesse and his staff were incredible! The day of the event, they made sure they pronounced everyone's names correctly and asked last minute questions. They even were accommodating when my husband was surprised by a dance with his grandmother. Laura and Jeff made our night so special! People couldn't help but be on the dance floor! They had a perfect pace of old and new songs to keep everyone having a great time. They were flexible with the set list and helped to make sure all the events happened on time and with ease. They also ran the music for our wedding ceremony. Everything flowed perfectly and left an exclamation mark on ceremony. Couldn't have been easier to work with and the friendliest of people! I will recommend them to everyone I know getting married! My husband and I had an amazing reception thanks to Jesse Webb. All of the music we wanted to be played was played, everyone had a great time, and in the events leading up to the big day they were with us every step of the way. Very organized and professional. I would not have used anyone else. Jesse Webb and his crew did a fantastic job at our wedding! They were organized and professional and kept the dance floor alive all night. They were great to work with, we made a few changes to the play list and they just made it happen. On the wedding day they made a few suggestions which made our day flow better than we could have ever expected. They were at the venue early and played to the crowd, they were awesome! Laura and Jesse were great from the booking till the end of the wedding night. They were also Very professional and affordable. Jesse helped me book and answered all my questions. Laura took care of the other behind the scene stuff. The night of the wedding we had Laura and Cameron they were such a great team. He had everyone laughing all night. JESSE WEBB ENTERTAINMENT IS YOUR DJ. You wont regret it. Book them today. What bride doesn’t have angst & anxiety on her special day, am I right?? Jesse Webb made me feel SO relaxed & kept in constant communication with me during our special evening! I was (very) specific with my entrance songs & he played them perfectly! I just cannot say enough about Jesse, his wife & crew. HIGHLY recommend for your big day or special event! I can’t say enough good things about Jesse Webb! We had our wedding on 8.10.18 and we got SO many compliments on our amazing music!! My new husband and I, as well as our guests, had the time our lives! We especially enjoyed looking at our book of all of our photo booth pictures from our guests. I would 100% recommend Jesse Webb for anyone’s DJ. Absolutely the best! Wishing I could go back to this day already. He even played a song after our last song because everyone was chanting “one last song”. Totally worth the price and he definitely plays the perfect music with the crowd. He was even perfect to use for our ceremony music. We were so happy we used Jesse Webb as our wedding DJ! He is so responsive, helpful, accommodating and fun! Jesse kept everyone dancing all night and so many people told us after the wedding how great the music was. I highly recommend Jesse Webb! Jesse was awesome! Him and his wife were so easy to work with! Jesse did such a fantastic job at our wedding. Our guests were on the dance floor all night and he helped make our wedding so much fun! The DJ really sets the tone of the wedding, and Jesse nailed it! He read the crowd and selected songs that kept our guests dancing! I would definitely recommend Jesse Webb for your wedding! If you are looking for a DJ that will keep your party going all night, look no further! Our DJ was very respectful and the entire planning process from beginning to end was super easy! They truly listened to our requests by playing all of our must have songs and carried out the vibe we were looking for in a fun, romantic evening. 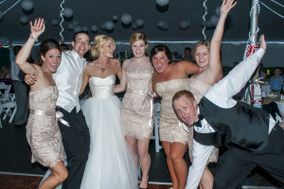 Not only that, but it was definitely a great deal to add on the photo booth- a striking success!!!! Jesse seriously is amazing! Kept all of our guests dancing the whole night just like we wanted! Truly professional and all around great guy, great experience! Jesse and his crew did a fabulous job!! We met with Jesse almost a year before our wedding and he was very attentive to us and all of our questions. As time went on, whenever we had a question, he was quick to respond within a day even though we were months away and he had more pressing issues. Closer to the wedding, his wide Laura spent an hour on the phone with us (we live out of state) and went over everything about the flow of the night and made some great suggestions that we never would have considered. He had all of our entrance music ready to go and worked with my wife and I on keeping us on track all night long. The sound system for speeches and music was great, and the lighting (we added uplighting) was very well done and not too over the top. He made sure to play the songs we listed, my wife wanted the electric slide played and he made sure to find us both before playing it to make sure we were on the floor and did not miss it! More over, the music he played all night kept the dance floor full! It wasn't hokey or dull, it was modern and had good beats to keep our guests entertained. We had multiple comments on the music and how much they enjoyed it. His final song of the night "Sweet Caroline" was the perfect end to a great evening! Jesse is by far the best DJ around! I honestly don't think anyone can compare to his professionalism and knowledge. Thank you very much for making our day even more special. My husband and I used Jesse Webb Entertainment for our wedding on March 24, 2018. We had Jesse himself and Devon as our DJs. We were so unbelievably happy with them. Jesse was amazing from the beginning. They make it so easy for their clients and they deliver such an awesome product. We are still hearing from our guests about how amazing of a wedding it was. Music had a huge part in that. Booking with Jesse was one of the best decisions we made. To those reading this, reviews are everything. We had other Dj's we could have gone with but because of Jesse's amazing reviews, personality, and how he pays attention to every small detail we decided to go with him. He genuinely cares in helping his clients have the best overall experience and for that we'll always be thankful. Thank you Jesse and Devin for making our wedding day the best day ever!!! We'll definitely tell everyone we know to go with you! They won't be disappointed. Very professional! The DJ's Matt and Devin came to use before the reception to run through the events planned for the night. DJ's picked music that fit our crowd to keep people on the dance floor. My mom even mentioned the next day that the DJ was good. Absolutely top notch. Not much more that can be said. They know what theyre doing an theyre good at it. Good prices. Couldn't be more happy with services rendered. Our DJ was completely amazing! He was able to accommodate our song list and our guests' song requests with a fantastic playlist. He was so good, guests never even noticed when things got delayed due to photographs or minor set backs. In all honesty, the DJ made the party and everyone had so much fun! Jesse Webb was the DJ at our daughter's wedding on September 30th and with very little direction did an outstanding job. He was a very professional and classy MC, had great lights and up-lights, checked several times regarding the pronunciation of names, made sure everyone was in line before wedding party entrance, verified all announcements and requests with the bride/groom, honored our do not play list even when the songs were requested, followed-up before the wedding when we failed to do so and generally alleviated a great deal of our wedding stress. We were very happy to have a full dance floor all the way to the end of our reception. We did a lot of research before selecting our DJ and couldn't have been happier with our selection! We had Jesse for our daughters wedding Sept 23, 2017. From beginning to end so great! Professional and fun and what a great experience!! Jesse was very accommodating to my requests for my reception and so helpful! He also performed my ceremony at Mooreland Mansion. It was wonderful because everyone could hear the music even though it was outside! He just has a lot of experience so everything went smoothly with the events of the reception. He's personable and his wife is just lovely. Highly recommend Jesse for ceremonies and receptions! Jesse Webb did an incredible job at our wedding and truly exceeded our expectations! Guests were on the dance floor the entire night. They are great to work with and I highly recommend! !